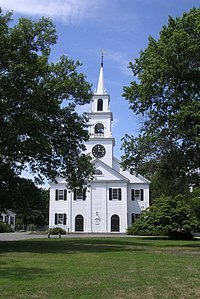 Dedham /ˈdɛdəm/ DED-əm is a town in and the county seat of Norfolk County, Massachusetts, United States. The population was 24,729 at the 2010 census. It is located on Boston's southwest border. On the northwest it is bordered by Needham, on the southwest by Westwood, and on the southeast by Canton. The town was first settled by Europeans in 1635. Settled in 1635 by people from Roxbury and Watertown, Dedham was incorporated in 1636. It became the county seat of Norfolk County when the county was formed from parts of Suffolk County on March 26, 1793. When the Town was originally incorporated, the residents wanted to name it "Contentment." The Massachusetts General Court overruled them and named the town after Dedham, Essex in England, where some of the original inhabitants were born. The boundaries of the town at the time stretched to the Rhode Island border. At the first public meeting on August 15, 1636, eighteen men signed the town covenant. They swore that they would "in the fear and reverence of our Almighty God, mutually and severally promise amongst ourselves and each to profess and practice one truth according to that most perfect rule, the foundation whereof is ever lasting love." They also agreed that "we shall by all means labor to keep off from us all such as are contrary minded, and receive only such unto us as may be probably of one heart with us, [and such] as that we either know or may well and truly be informed to walk in a peaceable conversation with all meekness of spirit, [this] for the edification of each other in the knowledge and faith of the Lord Jesus…" The covenant also stipulated that if differences were to arise between townsmen, they would seek arbitration for resolution and each would pay his fair share for the common good. In November 1798, David Brown led a group in Dedham protesting the federal government; they set up a liberty pole, as people had before the American Revolution. It carried the words, "No Stamp Act, No Sedition Act, No Alien Bills, No Land Tax, downfall to the Tyrants of America; peace and retirement to the President; Long Live the Vice President," referring to then-President John Adams and Vice President Thomas Jefferson. Brown was arrested in Andover but because he could not afford the $4,000 bail, he was taken to Salem for trial. Brown was tried in June 1799. Although he wanted to plead guilty, Justice Samuel Chase urged him to name those who had helped him or subscribed to his writings in exchange for freedom. Brown refused, was fined $480, and sentenced to eighteen months in prison. It was the most severe sentence up to then imposed under the Alien and Sedition Acts. Dedham is home to the Fairbanks House, the oldest surviving timber-frame house in the United States, scientifically dated to 1637. On January 1, 1643, by unanimous vote, Dedham authorized the first taxpayer-funded public school, "the seed of American education." Its first schoolmaster, Rev. Ralph Wheelock, a Clare College graduate, was paid 20 pounds annually to instruct the youth of the community. Descendants of these students would become presidents of Dartmouth College, Yale University and Harvard University. In 1818, though citizens were still taxed for the support of ministers and other "public teachers of religion," Dedham set a precedent toward the separation of church and state. Residents of the town selected a minister different than that chosen by the church members; the selection by residents was confirmed by the Supreme Judicial Court. This decision increased support for the disestablishment of the Congregational churches. In 1921, the historic Sacco and Vanzetti trial was held in the Norfolk County Courthouse in Dedham. Dedham Pottery is a cherished class of antiques, characterized by a distinctive crackle glaze, blue-and-white color scheme, and a frequent motif of rabbits and other animals. Dedham is sometimes called the "mother of towns" because 14 present-day communities were included within its original broad borders. Dedham is located at 42°14′40″N 71°9′55″W﻿ / ﻿42.24444°N 71.16528°W﻿ / 42.24444; -71.16528 (42.244609, −71.165531). On the northeast corner of High Street and Court Street the U.S. Coast & Geodetic Survey, now the U.S. National Geodetic Survey, has placed a small medallion into a granite block showing an elevation of 112.288 feet. In the geographical center of town is Oakdale. It is roughly defined by East Street to the west, Cedar Street to the south and east, and Whiting Ave to the north. The houses in the area around Woodleigh Road, which was declared to be one of the best streets in Greater Boston, have many homes designed by Henry Bailey Alden, who also designed the Endicott Estate. Nearby the subdivision consisting of Morse Avenue, Fulton Street, and Edison Avenue, is named Whiting Park. Precinct One, or Upper Dedham, is in the northwest corner of the town, between High Street and Common Street and the Westwood and Needham lines. Ashcroft is the neighborhood between Cedar Street and Sprague Street. It includes Paul Park and the Capen School. Fairbanks is the neighborhood between East Street and Wigwam Pond. According to the United States Census Bureau, the town has a total area of 10.6 square miles (27 km2), of which 10.4 square miles (27 km2) is land and 0.2 square miles (0.52 km2) (1.79%) is water. Dedham's population is spread out with 22.2% under the age of 18, 5.8% from 18 to 24, 31.1% from 25 to 44, 24.2% from 45 to 64, and 16.6% who were 65 years of age or older. The median age was 40 years. For every 100 females, there were 93.4 males. For every 100 females age 18 and over, there were 92.0 males. The town's seal was originally designed by a member of the Dedham Historical Society. In the center is a crest containing the Old Avery Oak. When the tree was finally felled, the gavel used by the Moderator at Town Meeting was carved out of it. Above the tree are the scales of justice, representing Dedham as the county seat and home to Norfolk County's courts. On the left of the tree are agricultural instruments, and on the right is a factory, showing Dedham's history first as a town of farmers and then as one with a number of mills and factories, particularly along Mother Brook. Below the tree is a banner with the word "Contentment," the name of the original plantation. The town flag is red with the seal prominent and in the center. In the lower left corner is part of the Avery Oak, and in the lower right is part of the Fairbanks House. It hangs in the selectmen's chambers at town hall and in the Great Hall of the Massachusetts State House. A charter adopted in 1998 lays out the basic structure of the Town government, although it has been amended occasionally over the years. A seven-member Charter Advisory Committee, appointed in 2012, recommended six substantial changes and numerous minor changes be made to the document. The Selectmen consolidated them into six articles for Town Meeting's consideration, and five were presented to the Meeting in 2013. Voters approved four of them in 2014. A version of the sixth and final proposal was adopted at the Spring 2014 Annual Town Meeting. According to Dedham's Charter, the "administration of all the fiscal, prudential, and municipal affairs of the town, with the government thereof, shall be vested in a legislative branch, to consist of a representative town meeting." Town Meeting is to consist of no less than 270 members, but not more than necessary to achieve an equal number coming from each precinct. There are currently seven districts, but could be as few as six or as many as nine, with lines drawn by the Board of Selectmen and the Registrars of Voters every ten years. Votes are by voice unless members call for a standing or roll call vote, either of which can be called for by the Moderator. All Town officers are required to attend Town Meeting and multiple member bodies must send at least one representative who have all the privileges of a Member except the right to vote. If 5% of Town voters petition the Board of Selectmen within 14 days of Town Meeting, any action taken may be submitted to voters. The final result is to be determined by majority vote, but Town Meeting can not be overruled unless 20% of registered voters participate. Town Meeting sets its own rules and keeps a journal of proceedings. The Town Meeting may establish various ad-hoc and standing committees on which any Town Meeting Member or voter may serve. Before each Spring Annual Town Meeting, the Public Service Recognition Award is given to recognize citizens who have performed outstanding acts of service to the community. Currently Town Meeting consists of 273 members, or representatives, with each of the seven districts, or precincts, electing 39. Thirteen are elected from each precinct each year and serve a three-year term. Each precinct elects from its own members a Chairman, Vice Chairman, and Secretary. To be eligible, candidates must have 10 registered voters from their precinct sign nomination papers. Town Meeting Representatives can not serve on any other elected board or on the Finance and Warrant Committee. Members who move from the district or are removed by redistricting may serve until the next Town Election; however, any member who moves out of the Town immediately ceases to be a Member. In case of a vacancy, the remaining term is to be filled at the next town election. If no election is to take place within 120 days of the vacancy, then the district chairman is to call together the members of the district, and they are to elect a member who will serve until the next town election. The Warrant at Town Meeting includes the articles to be voted on. Any elected or appointed board, committee, town officer, or any ten voters may place an article on the warrant. Each article to be voted on is directed by the Board of Selectmen to an appropriate board or committee to hear and provide the original motion at Town Meeting. All articles expending funds are directed to the Finance Committee; articles dealing with planning and zoning to the Planning Board; articles relating to by-laws to the By-Law Committee. The Finance Committee recommendation has the force of the original motion on all articles except those related to zoning. The Planning Board makes the original motion for those. The Chairmen of the several districts elect from amongst themselves a chairman. This Chairman of the Chairmen hosts what is officially known as the District Chairmen's Warrant Review Meeting, but is much more commonly referred to as Mini Town Meeting. The "Mini," first held in 1978, is generally a week or two before the actual Town Meeting. The purpose of the Mini is to air out several of the contentious issues before bringing them to the floor of Town Meeting. The executive branch of the Town Government is "headed" by a Board of Selectmen. The Board of Selectmen have five members who are elected for three-year terms and are the chief policy making body for the town. They appoint a Town Manager who runs the day-to-day affairs of the Town. They also appoint constables, registrars of voters and other election officers, the board of appeals, conservation commission, historic district commission, and members of several other multiple member boards. Selectmen set policy for all departments below it, but are not involved in the day-to-day affairs of the Town. They issue licenses and can investigate the affairs and the conduct of any town agency. The Elected Town Clerk serves a three-year term and works full-time for the Town. The Clerk is "the keeper of vital statistics of the town and the custodian of the town seal and all public records, administer[s] the oaths of office to all town officers... [and is] the clerk of the town meeting." In the role as clerk of town meeting, he notifies the public and members of the Town Meeting and keeps a verbatim record of proceedings. Town Meetings are presided over by the Town Moderator, but he has no vote unless all the Members present and voting are equally divided. At the first Town Meeting following the annual town election, he is to appoint, subject to Town Meeting's confirmation, a Deputy Moderator from the elected Members. The Deputy serves in case of the Moderator's absence or disability. The current Town Moderator is Dan Driscoll. The seven members of the School Committee are elected for three-year terms and appoint a Superintendent of Schools. They also set policy for the School Department. The School Committee is currently chaired by Stephen M. Bilafer, with Kevin R. Coughlin serving as Vice Chair. The other members of the committee are Mayanne MacDonald Briggs, Lisa Laprade, Tracey White, Joshua Donati, and Melissa Pearrow. The three elected members of the Board of Assessors serve three-year terms and annually make a fair cash valuation of all property within the town. The current chair of the board is Richard J. Schoenfeld, with Christopher J. Polito serving as Vice-Chair and Cheryl S. Sullivan serving as Clerk. The three elected members of the Board of Health are responsible for the formulation and enforcement of rules and regulations affecting the environment and the public health. Currently the board is chaired by Leanne Jasset, B.S.P. RPH, with Katherine M Reda R.N serving as Vice Chair. Patricia M Roberts R.N also serves on the board. The Board of Library Trustees has five members, each of whom serves three-year terms, and has care of the Town's public library at the Endicott Branch and Main Branch. The Board is responsible for all library policy, the library budget, and hiring and firing the library director. The board is currently chaired by Margaret M. Connolly, with Sarah Santos serving as Vice Chair. Monika E. Wilkinson, Mary Ann Silwa, and Tracy L. Driscoll also serve on the board. The five elected members of the Planning Board make studies and prepare plans concerning the resources, possibilities, and needs of the town. It also prepares the Master Plan. Currently the board is chaired by John R. Bethoney, with James E. O'Brien IV serving as clerk. Jessica Porter, Michael A. Podolski, Esq. and James McGrail are also members. There are five elected members of the Parks & Recreation Commission. Section 3-10 of the Town Charter states that the goal of the commission is to promote physical education, play, recreation, sport and other programs for people of all ages. The commission is currently chaired by Chuck Dello Iacono. Jon Briggs, Lisa Moran, Jim Maher, and Tye Donahue serve as Members of the commission. There are five elected Commissioners of Trust Funds who manage and control all funds left, given, bequeathed, or devised to the town, and distribute the income in accordance with the terms of the respective trusts. The commission is currently chaired by Michael E. Malamut, with Ronald B. Slack serving as Vice Chair. Bob Desmond, Emily Reynolds, and Salvatore A Spada currently serve as members. There are five members of the Housing Authority. Four are elected by the Town and one is appointed by the Commonwealth Commissioner of Community Affairs. As members of the Board, they have all of the powers and duties which are given to housing authorities under the constitution and laws of the Commonwealth. The board is currently chaired by John G. Wagner, with Mary Louise Munchbach serving as Vice Chair. Catherine Luna serves as the board's Treasurer with Donna M. Brown as Assistant Treasurer. The current State Appointee to the board is Margaret Matthews. 1994 4,498 (43.06%) W. Mitt Romney 5,858 (56.08%) Edward M. Kennedy 65 (0.62%) Lauraleigh Dozier 25 (0.24%) William A. Ferguson Jr. The theater company and Viacom/ CBS Corporation parent National Amusements is based in Dedham. Dedham is also home to The Norfolk & Dedham Group, a regional mutual insurance company. The Dedham Public Schools operates seven schools and is known for the first implementation of a tax supported, free public school system, now used nationally. Ursuline Academy, an independent college preparatory day school for young women in grades 7–12. The Rashi School, a Reform Jewish elementary and middle school. Little Sprouts Early Education and Childcare, a preschool and kindergarten. Ames School, a former public elementary school named after distinguished Dedham resident Fisher Ames. St. Mary of the Assumption School, a former Catholic elementary school that operated as a part of St. Mary of the Assumption Parish until 1975. The Quincy School, a former public elementary school that operated until 1982. The Dexter School, a former public elementary school now operating as a private preschool and kindergarten, Little Sprouts Early Education and Childcare, Dedham location. The former First Church of Christ, Scientist building in Dedham. Boston United Hand in Hand Cemetery is located on Lower East Street straddling the West Roxbury line. Dating back to 1875, the original plot was full by 1896 but subsequently expanded a number of times. There are graves as recent as 1980 in the West Roxbury portion; the Dedham portion is still active. Chestnut Hill's Congregation Mishka Tefila currently owns the property. Troop 3 of the Boy Scouts of America was founded on March 5, 1917 by Charles H. Stackpole, a 52-year-old Methodist clergyman who served as the troop's first Scoutmaster. As of 2017[update], Peter Low was Scoutmaster. It is currently chartered at the Church of the Good Shepard in Oakdale Square. East Dedham Firehouse, possibly the oldest wood framed firehouse in use in the United States. Originally built in 1855, it was designed with stables in the basement for the horses that carried the apparatus. Legacy Place, outdoor shopping center. Flag Day Parade: The Flag Day Parade began in 1967 and quickly became one of Dedham's most beloved traditions. In 2017, for the 50th anniversary, the parade was moved from the traditional June 14, Flag Day, to Saturday, June 17. This was to accommodate the fireworks at Memorial Park that were part of the celebration. Commuter rail service from Boston's South Station is provided by the MBTA with stops at Endicott and Dedham Corporate Center on its Franklin Line. Also MBTA Bus route 34 Dedham Line to Forest Hills serves Washington Street. Bus route 34E Walpole Center to Forest Hills serves Washington Street, Dedham Square, and the Dedham Mall. Bus route 35 Dedham Mall to Forest Hills serves Washington Street. Bill Hunnefield, infielder for Chicago White Sox (1926-1930), Cleveland Indians (1931), Boston Braves (1931) and New York Giants (1931). George F. Williams, U.S. Representative, Ambassador to Greece and Montenegro, known as "sage of Dedham"
John Allin, patriarch of New England and signatory to the covenant. Eli Sagan (1927–2015), clothing manufacturer, lecturer and author in cultural anthropology and political activist who served on the national finance committee for George McGovern's 1972 presidential campaign, a role that earned him a spot on Richard Nixon's Enemies List in 1973. Tommy Vietor, National Security Council spokesperson, podcast host of Pod Save America. ^ a b "Population and Housing Occupancy Status: 2010 - State -- County Subdivision, 2010 Census Redistricting Data (Public Law 94-171) Summary File". U.S. Census Bureau. Retrieved June 26, 2011. ^ "Race and Ethnicity in the Town of Dedham, Norfolk County, Massachusetts". Statistical Atlas, Cedar Lake Ventures, Inc. April 17, 2015. Retrieved August 28, 2016. ^ "Ancestry in the Town of Dedham, Norfolk County, Massachusetts". Statistical Atlas, Cedar Lake Ventures, Inc. April 17, 2015. Retrieved August 28, 2016. ^ a b c d Stone 2004, p. 64. ^ Tise 1998, p. 420. ^ Curtis 2000, p. 88. ^ a b Tise 1998, p. 421. ^ Simon 2003, p. 55. ^ Sacchetti, Maria (November 27, 2005). "Schools vie for honor of being the oldest". Boston Globe. Retrieved May 27, 2014. ^ Bolton, Michelle Morgan (May 17, 2009). "Holding court". Boston.com. Retrieved May 26, 2015. ^ Gehrman, Elizabeth (April 10, 2015). "2015 Tops Spots to Live: The best streets in Greater Boston". The Boston Globe. Retrieved April 10, 2015. ^ Perkins, Matt (January 26, 2012). "Morse Ave. Fence Raises Questions, Concern". Patch.com. Retrieved April 10, 2015. ^ Homefacts.com. "Dedham, MA Religions | Homefacts". www.homefacts.com. Retrieved August 31, 2015. ^ a b c d e Cook, Louis Atwood. History of Norfolk County, Massachusetts, 1622-1918, Volume 1. ^ "NEW MUSEUM ACQUISITIONS" (PDF). Dedham Historical Society News-Letter (January 2005). Retrieved May 27, 2015. ^ Fay, Susan (January 17, 2013). "New Dedham Public Service Recognition Award". Patch. Retrieved October 20, 2016. ^ Halliday, Ryan J. (April 4, 2006). "Mini-TM reviews 50 articles - $3.75M override proposed; superintendent says he's forced to lay off two dozen". Daily News Transcript. p. A3. Retrieved May 3, 2016. ^ "School Committee". Town of Dedham. Retrieved April 8, 2018. ^ "2016 President General Election Statewide (showing only Norfolk County)". electionstats.state.ma.us. Retrieved April 8, 2018. ^ "2012 President General Election Statewide (showing only Norfolk County)". electionstats.state.ma.us. Retrieved April 8, 2018. ^ "2008 President General Election Statewide (showing only Norfolk County)". electionstats.state.ma.us. Retrieved April 8, 2018. ^ "2000 President General Election Statewide (showing only Norfolk County)". electionstats.state.ma.us. Retrieved April 8, 2018. ^ "2004 President General Election Statewide (showing only Norfolk County)". electionstats.state.ma.us. Retrieved April 8, 2018. ^ "1996 President General Election Statewide (showing only Norfolk County)". electionstats.state.ma.us. Retrieved April 8, 2018. ^ "1992 President General Election Statewide (showing only Norfolk County)". electionstats.state.ma.us. Retrieved April 8, 2018. ^ "1988 President General Election Statewide (showing only Norfolk County)". electionstats.state.ma.us. Retrieved April 8, 2018. ^ "1984 President General Election Statewide (showing only Norfolk County)". electionstats.state.ma.us. Retrieved April 8, 2018. ^ "1980 President General Election Statewide (showing only Norfolk County)". electionstats.state.ma.us. Retrieved April 8, 2018. ^ "1976 President General Election Statewide (showing only Norfolk County)". electionstats.state.ma.us. Retrieved April 8, 2018. ^ "1972 President General Election Statewide (showing only Norfolk County)". electionstats.state.ma.us. Retrieved April 9, 2018. ^ "2018 U.S. Senate General Election Statewide (showing only Norfolk County)". electionstats.state.ma.us. Retrieved December 6, 2018. ^ "2014 U.S. Senate General Election Statewide (showing only Norfolk County)". electionstats.state.ma.us. Retrieved April 9, 2018. ^ "2013 U.S. Senate General Election Statewide (showing only Norfolk County)". electionstats.state.ma.us. Retrieved April 9, 2018. ^ "2012 U.S. Senate General Election Statewide (showing only Norfolk County)". electionstats.state.ma.us. Retrieved April 9, 2018. ^ "2010 U.S. Special Senate General Election Statewide (showing only Norfolk County)". electionstats.state.ma.us. Retrieved April 9, 2018. ^ "2008 U.S. Senate General Election Statewide (showing only Norfolk County)". electionstats.state.ma.us. Retrieved April 10, 2018. ^ "2006 U.S. Senate General Election Statewide (showing only Norfolk County)". electionstats.state.ma.us. Retrieved April 10, 2018. ^ "2002 U.S. Senate General Election Statewide (showing only Norfolk County)". electionstats.state.ma.us. Retrieved April 10, 2018. ^ "2000 U.S. Senate General Election Statewide (showing only Norfolk County)". electionstats.state.ma.us. Retrieved April 15, 2018. ^ "1996 U.S. Senate General Election Statewide (showing only Norfolk County)". electionstats.state.ma.us. Retrieved April 16, 2018. ^ "1994 U.S. Senate General Election Statewide (showing only Norfolk County)". electionstats.state.ma.us. Retrieved April 16, 2018. ^ "1990 U.S. Senate General Election Statewide (showing only Norfolk County)". electionstats.state.ma.us. Retrieved April 16, 2018. ^ "1984 U.S. Senate General Election Statewide (showing only Norfolk County)". electionstats.state.ma.us. Retrieved April 16, 2018. ^ "1982 U.S. Senate General Election Statewide (showing only Norfolk County)". electionstats.state.ma.us. Retrieved April 18, 2018. ^ "1978 U.S. Senate General Election Statewide (showing only Norfolk County)". electionstats.state.ma.us. Retrieved May 1, 2018. ^ "1976 U.S. Senate General Election Statewide (showing only Norfolk County)". electionstats.state.ma.us. Retrieved May 9, 2018. ^ "1972 U.S. Senate General Election Statewide (showing only Norfolk County)". electionstats.state.ma.us. Retrieved June 5, 2018. ^ "1970 U.S. Senate General Election Statewide (showing only Norfolk County)". electionstats.state.ma.us. Retrieved June 15, 2018. ^ "2018 U.S. House General Election 8th Congressional District". electionstats.state.ma.us. Retrieved December 6, 2018. ^ "2016 U.S. House General Election 8th Congressional District". electionstats.state.ma.us. Retrieved June 16, 2018. ^ "2014 U.S. House General Election 8th Congressional District". electionstats.state.ma.us. Retrieved June 16, 2018. ^ "2012 U.S. House General Election 8th Congressional District". electionstats.state.ma.us. Retrieved June 17, 2018. ^ "2010 U.S. House General Election 9th Congressional District". electionstats.state.ma.us. Retrieved June 17, 2018. ^ "2008 U.S. House General Election 9th Congressional District". electionstats.state.ma.us. Retrieved June 17, 2018. ^ "2006 U.S. House General Election 9th Congressional District". electionstats.state.ma.us. Retrieved June 17, 2018. ^ "2004 U.S. House General Election 9th Congressional District". electionstats.state.ma.us. Retrieved June 18, 2018. ^ "2002 U.S. House General Election 9th Congressional District". electionstats.state.ma.us. Retrieved June 18, 2018. ^ "2001 U.S. House Special General Election 9th Congressional District". electionstats.state.ma.us. Retrieved June 18, 2018. ^ "2000 U.S. House General Election 9th Congressional District". electionstats.state.ma.us. Retrieved June 18, 2018. ^ "1998 U.S. House General Election 9th Congressional District". electionstats.state.ma.us. Retrieved November 17, 2018. ^ "1996 U.S. House General Election 9th Congressional District". electionstats.state.ma.us. Retrieved November 17, 2018. ^ "1994 U.S. House General Election 9th Congressional District". electionstats.state.ma.us. Retrieved November 22, 2018. ^ "1992 U.S. House General Election 9th Congressional District". electionstats.state.ma.us. Retrieved November 22, 2018. ^ "1990 U.S. House General Election 9th Congressional District". electionstats.state.ma.us. Retrieved November 22, 2018. ^ "1988 U.S. House General Election 9th Congressional District". electionstats.state.ma.us. Retrieved November 22, 2018. ^ "1986 U.S. House General Election 9th Congressional District". electionstats.state.ma.us. Retrieved January 15, 2019. ^ "2018 Governor General Election (showing only Norfolk County)". electionstats.state.ma.us. Retrieved December 6, 2018. ^ "2014 Governor General Election (showing only Norfolk County)". electionstats.state.ma.us. Retrieved December 6, 2018. ^ "2010 Governor General Election (showing only Norfolk County)". electionstats.state.ma.us. Retrieved December 15, 2018. ^ "2006 Governor General Election (showing only Norfolk County)". electionstats.state.ma.us. Retrieved December 15, 2018. ^ "Charles J. Capen School". Flickr. Retrieved February 10, 2018. ^ Baruch Stier, Oren; Landres, J. Shawn (2006). Religion, Violence, Memory, and Place. Indiana University Press. ^ "Boston United Hand in Hand Cemetery". Patch. Archived from the original on May 28, 2014. Retrieved May 27, 2014. ^ a b c Bowen, Max (March 7, 2017). "Dedham Troop 3 celebrates 100th anniversary". Dedham Transcript. Retrieved March 8, 2017. ^ Heald, Hana Janjigian (June 12, 2015). "Dedham's 48th Annual Flag Day Parade Set for Sunday". The Dedham Times. p. 1. ^ a b Martin, E.F. (November 18, 2016). "Fireworks to Celebrate the Flag in June". The Dedham Times. ^ "Buck Danner". Pro-Baseball-Reference.com. Retrieved June 23, 2014. ^ "Dedham-native Hamilton recalls '70 win". Boston Herald. February 16, 2008. Retrieved May 27, 2014. ^ "John Frederick Kiley". Pro-Baseball-Reference.com. Retrieved June 23, 2014. ^ "Lefty Mills". Pro-Baseball-Reference.com. Retrieved June 23, 2014. ^ "Freddie Roach, Boxer Behind Hollywood, Steps Into the Ring With HBO Series". The Hollywood Reporter. Retrieved September 18, 2017. ^ "Sarah Parsons". 2014 Trustees of Dartmouth College. Retrieved June 23, 2014. ^ "Warren Cummings Smith". Dartmouth College. Retrieved June 23, 2014. ^ Long, Tom (October 23, 2004). "Deborah Cochran, at 64; politician represented Dedham". Boston.com news. Retrieved September 28, 2017. ^ "Maryanne Lewis". Dedham High School Alumni Association. Archived from the original on June 23, 2014. Retrieved June 23, 2014. ^ "Horace Mann". 2010 by the Litchfield Historical Society. Retrieved June 23, 2014. ^ New England Historic Genealogical Society (1907). New England Historic Genealogical Society. The Society. p. 185. ^ "Charles M. McGowan". the Boston Herald and Herald Media. Retrieved June 23, 2014. ^ "Paul McMurtry". 2014 Planck LLC d/b/a Patch Media. Retrieved June 23, 2014. ^ "Nelsen, Betty Jo 1935 | Wisconsin Historical Society". Wisconsin Historical Society. August 8, 2017. Retrieved September 28, 2017. ^ family, Sears family and McDougall. "Sears and MacDougall family collection 1910s-1960s1924-1953". Retrieved September 28, 2017. ^ Sanchez, Beverly; Sanchez-Moran, Austin (2010). "Historic Dedham Village: A Self-Guided Walking Tour" (PDF). Dedham Historical Society. Retrieved September 28, 2017. ^ "LeBaron Bradford Colt". Biographical Directory of the United States Congress. Retrieved June 23, 2014. ^ "Samuel Dexter". Biographical Directory of the United States Congress. Retrieved June 23, 2014. ^ "Frederick D. Ely". Biographical Directory of the United States Congress. Retrieved June 23, 2014. ^ Hevesi, Dennis (April 30, 2011). "David L. Hackett Dies at 84; Fought Poverty and Crime". The New York Times. ISSN 0362-4331. Retrieved June 4, 2017. ^ "John William McCormack". Biographical Directory of the United States Congress. Retrieved June 23, 2014. ^ "United Kingdom - Chiefs of Mission - People - Department History - Office of the Historian". history.state.gov. Retrieved January 15, 2018. ^ "Austria - Chiefs of Mission - People - Department History - Office of the Historian". history.state.gov. Retrieved January 15, 2018. ^ "Frederick J. Stimson". 2014 Planck LLC d/b/a Patch Media. Retrieved June 23, 2014. ^ Sargent, Porter (1916). A Handbook of New England. P.E. Sargent. p. 207. ^ Levin, Jay. "Eli Sagan, 87, proud Nixon 'enemy'", The Record (Bergen County), January 9, 2015. Accessed January 18, 2015. "Mr. Sagan and his wife, Frimi, who taught English at Dwight-Englewood School, lived in Englewood for 55 years. They moved to Dedham, Mass., in 2011." ^ Tommy Vietor [@TVietor08] (April 23, 2013). "Lots of reasons to love my hometown of Dedham, MA. Here's one www.museumofbadart.org @BostonGlobe @MarkLeibovich @mikebarnicle @BillSimmons" (Tweet) – via Twitter. ^ Tommy Vietor [@TVietor08] (July 23, 2016). "I grew up in Dedham and don't miss the wild New England summer storms. Hope you guys didn't sustain damage" (Tweet) – via Twitter. ^ "J! Archive - Jill Regan". www.j-archive.com. Retrieved March 6, 2019. Curtis, Michael Kent (2000). Free speech, "the people's darling privilege": struggles for freedom of expression in American history. Duke University Press. p. 88. ISBN 978-0-8223-2529-1. Stone, Geoffrey R. (2004). Perilous times: free speech in wartime from the Sedition Act of 1798 to the war on terrorism. W. W. Norton & Company. p. 64. ISBN 978-0-393-05880-2. Simon, James F. (2003). What Kind of Nation: Thomas Jefferson, John Marshall, and the Epic Struggle to Create a United States. Simon and Schuster. p. 55. ISBN 978-0-684-84871-6. Tise, Larry E. (1998). The American counterrevolution: a retreat from liberty, 1783–1800. Stackpole Books. ISBN 978-0-8117-0100-6. Wikimedia Commons has media related to Dedham, Massachusetts.